Nautilus-GDoc is a nice little Nautilus script that will help you integrate Nautilus with Google Docs. 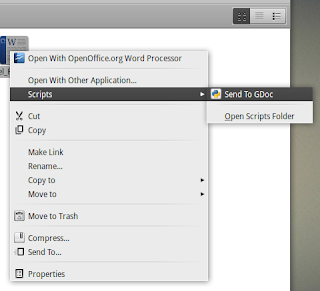 A new 'send to GDoc' option will be available in your Nautilus right click menu. Right click on the document in the nautilus file manager. Goto Scripts - Send To GDoc(as shown in the screenshot). This will ask for username and password for the first time or if the last session is timed out. More details can be found in the Read Me file.